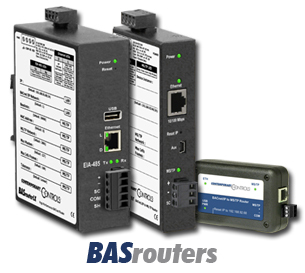 May 2013 – With the newly released BASrouterLX joining the BASrouter and the Portable BASrouter, Contemporary Controls now provides three different BACnet/IP router solutions to help integrators make a cost-effective connection to BACnet MS/TP. To better explain the capabilities and differences of the three BAS routers, Contemporary Controls has updated its BACnet Router Application Guide that provides examples of common BACnet routing applications and how each of these routers can be used to solve a particular need. View the Application Guide (PDF) here.